The hotel was a nice classic beach hotel from days gone by. It was clean and had classic charm. Stairs with beautiful heavy wooden railings added to the charm. No elevator, of course. The room was small but easily accommodated two double beds. 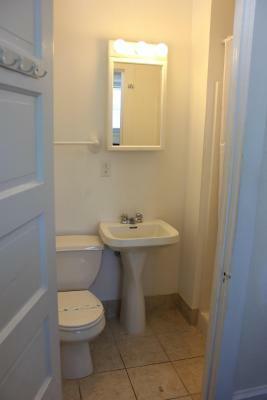 It also has a microwave, refrigerator and full bathroom. There are also bathrooms with showers in the hall for use after checking out or if two people want to be getting ready after the beach. The heated pool was very nice and I enjoyed sitting out on the porch at night and talking with others staying at the hotel. The location to the boardwalk and beach was nice, but I did not like that area of beach. Excellent location. Near boardwalk, shops ,and restaurants. Great staff. They were painting and staining public areas while we and many others were lodged there. Very smelly. Got paint on me. I liked how close it was to the beach. The pool was cute and I enjoyed it. It's got a great porch that is relaxing. Very laid back staff and chill atmosphere. I enjoyed my stay. Is it a 5 star hotel? No, but the bed was so comfortable. It wasn't perfect, but I just wanted a place to sleep and it was comfortable and I would return. They allowed me to check out, go to the beach and come back for a swim and a shower even after I checked out. To me, that in itself makes me want to go back. Check in was early, too. I could check in as early as noon. 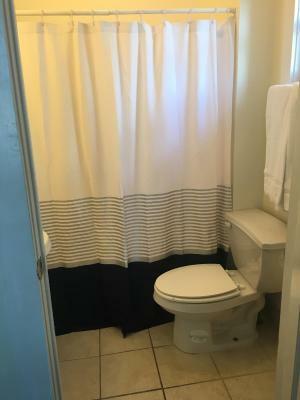 Clean room , decent pool , overall I have stayed here a few times and was satisfied. Loved it! 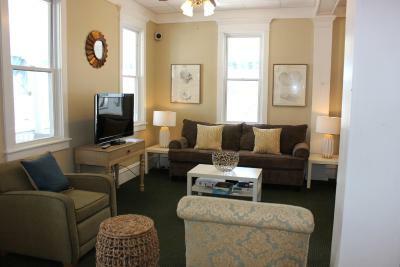 I stayed in a family suite, yes, the building is old, but it was done so nicely, lots of space, cute decor. Perfect for me, and I can't wait to come back! It may not be considered a luxury hotel, but it was for me! I loved the swans on the bed. There was shampoo and conditioner supplied. My son loved the breakfast and front porch. We got a free bag of ice, and the wi-fi works beautifully. I only had the room for one night, and then moved to another hotel across the street which was a lot more money, and I have to say, Ocean Breeze was so much nicer! I just hope I can get another room when I need it! Thanks!! Great location. Onsite parking, free beach tags and especially the two extra shower/bathrooms were very helpful and they allow you to use these the day you check out all day (so we could,leisurely take the whole day at the beach knowing we could park and wash up any time). Very friendly staff and great porch. We were able to get a great price on Monday before the weekend. The staff was so nice and friendly. It was such a cute place and the room was great. It’s a nice little place to stay and perfect location so close to everything. My boyfriend and I had a great time while staying here. Ocean Breeze Hotel This rating is a reflection of how the property compares to the industry standard when it comes to price, facilities and services available. It's based on a self-evaluation by the property. Use this rating to help choose your stay! 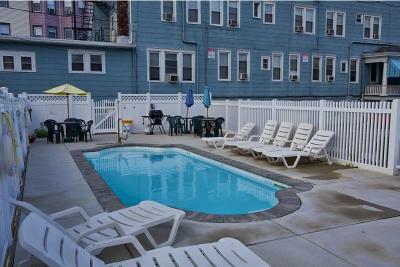 Located minutes from the beach, this hotel features free Wi-Fi, an outdoor pool and rooms with cable TV. The Ocean City boardwalk is only a 5-minute walk away. All non-smoking rooms at Ocean Breeze Hotel have cottage-chic décor. 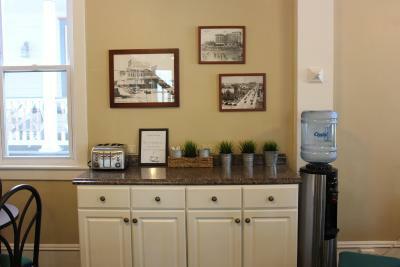 Guests are provided with air conditioning, a refrigerator and a private bathroom. Free breakfast includes assorted cereals, bagels, coffee, tea and Juice during summer months. Barbecue facilities are also available. 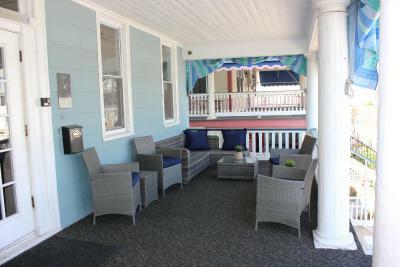 Guests can enjoy American fare at OC Surf Café or Varsity Inn, only steps from Ocean Breeze. 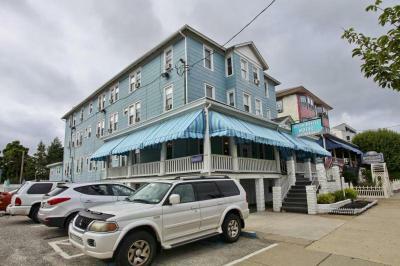 A variety of shops, entertainment and dining options are also available along the boardwalk like Jilly’s Arcade and The Ocean City Music Pier is a 5-minute drive from the hotel. When would you like to stay at Ocean Breeze Hotel? 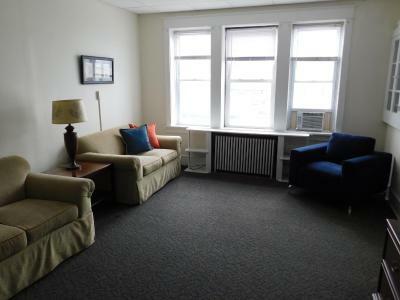 This room features cable TV and a refrigerator. House Rules Ocean Breeze Hotel takes special requests – add in the next step! Ocean Breeze Hotel accepts these cards and reserves the right to temporarily hold an amount prior to arrival. Guests must contact property if checking in after 8 pm. The hall bathrooms were adequate, but not as nice as the bathrooms in the rooms. 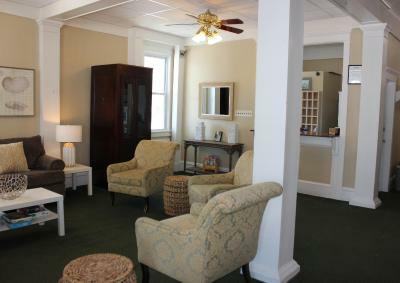 The style was expected for an old cottage style hotel. The inside of the building had a constant smell of cigarette smoke. The shower/tub did not have any hot water, it was lukewarm at best. The beds were fair but the room was semi-spacious and fine for one night. There was no one at the front desk after 2:00 p.m. and there was no one there to check out the following morning either. It was expensive for one night and I would not stay for more than a night in the future. It is a beautiful but old building. The toilet was clogged and it was 5 hours until it was worked on. It was explained that the maintenance person was off site. It was taken care of, but the management seemed to be generally unconcerned at our discomfort. There fortunately was a restroom upstairs we had access to. Also the room was not vacuumed nor the bathroom cleaned during our three night stay. Towels were replaced and bed made. No additional soap, shampoo etc given after check in. Also no breakfast despite continental being claimed on website. Outdoor shower difficult to access. Room was very tiny just barely space for queen bed and dresser. No chair, no closet. Location was very good. 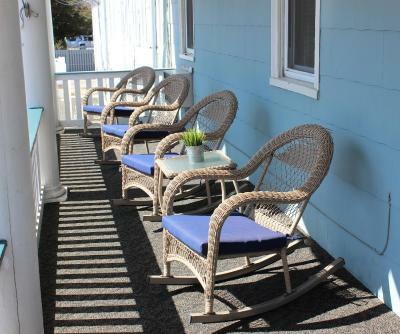 Close enough to beach, boardwalk and downtown shopping. Many restaurants close by. 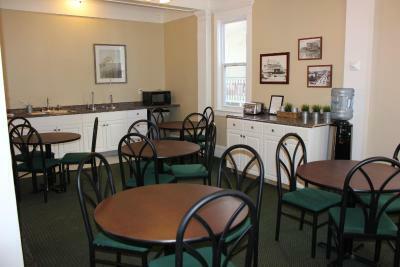 The common areas were pleasant and clean. Painting walls during our visit. No breakfast. Bathrooms has very low water pressure. Water took a long time to heat up. Young man at desk more interested in his phone. Luke warm water for showers. Room itself was very nice and clean. I loved the location and our room was incredible! I didn't like that there was a light that was shining over my window in the bathroom, so I had to keep the bathroom door closed because the light was so bright. I think it could use a good paint job in the rooms to make it more pleasant. It could use some cosmetic work, like paint the rooms and put some curtains up to make the rooms darker. But, I was only there for one night and it was fine. I would return. The price was right! Bathroom floor was not that clean. And bed spread had stains. When we checked in around 4pm, there was nobody at the front desk. We had to wait about 20 minutes until someone finally came to the front desk. In our room, there was no outlet close to the TV to be plugged into. We had to make 3 trips to the front desk because each extension cord given to us didn't work. Lastly, the parking was bad because the lots aren't very big. If you're lucky to get a spot in one of the lots, leave your car there because most likely, you'll lose your spot. If all spots are taken, you've got to find street parking. We were allowed to stay for the day after we checked out and were allowed to keep our car parked in the lot. We also liked that the hotel was close to the beach and in walking distance to many restaurants. Lastly, I forgot something in my room and the manager made sure to hold the item for me at the front desk, which was very nice and much appreciated. Would definitely return just because of this nice courtesy!